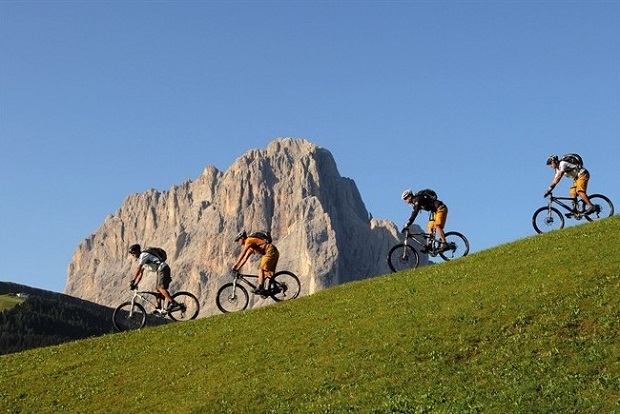 Between June and September the ski slopes of Val Gardena become trails for mountain bikers. But even if you do not have calves of steel, try the routes on two wheels and zero impact. In case you want to have the full experience you can also look for what suits you through a massive range of mtbs. Finally in the evening you can enjoy wine, bacon and alpenglow. After the snow has melted the Sella Ronda also lends itself to be toured by bike. This is the chance to take the advantage of the ecological vocation of Val Gardena. The best dates are June 21 to 25 and then again on September 23. There’s no cars or motorbikes on the Dolomite passes around the Sella. It is closed to traffic to ensure the thousands of cyclists who will participate in the Sella Ronda Bike Day, the Sella Ronda Hero and the Eco Sella Ronda Bike Day to enjoy the ride and nature without the exhaust gases. These events are hard work! 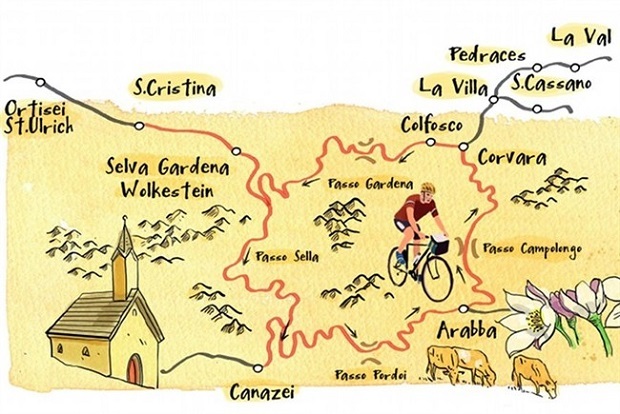 The ride is counter clockwise starting from Selva in order to reach the Passo Sella and Passo Gardena and then go to Val Badia, the Pordoipass, Arabba and back. Of course even if it is not a race, the Sella Ronda tests even the most trained. But there is an alternative. Between the Val Gardena and Alpe di Siusi there are as many as 33 tracks of various difficulties for mountain bikes with 1.000 km of slopes with altitudes between 900 and 2.300 meters. You can do it yourself by downloading the paths with gps data, or qualified instructors who assist during the enterprise. For an active holiday cycling, the Tourist Consortium of Val Gardena also provides weekend packages with two overnights, guided tours and technical assistance for 207 €. If you have not grappled with the bike or you still finished climbing on top of the Grande Cir marking the configuration between the Val Badia and Val Gardena and after an hour’s walk from Passo Gardena, you can sit at an altitude of 2.592 meters to see one of the greatest spectacles of nature, the alpenglow or dolomite rocks that glow red at sunset and turn the peaks around you in a fiery landscape. Bring a bottle of white wine, two glasses and a piece of good cheese bought in Ortisei Avesani or Maciaconi Gourmet in Santa Cristina and immense yourself in the Enlightenment. If you do not feel like walking alone you can join one of the guided tours at sunset of the program valgardena active. It starts in the afternoon. The only drawback is that dinner in the lodge or picnic evening at altitude is not expected. However, in town evening options are many. If you’re in the mood for romance, book the only table for two in the cellar of the Hotel Nives. Between the bottles, sit eye to eye with candlelight where you can taste the typical dishes of the valley. In Ortisei, at the restaurant Anna Stuben you can only eat organic products cooked by the chef Raimund Brunner while the Alpenroyal chef Felice Lo Basso Ladin cuisine mixes traditional Apulian.